Amazon has the Xbox Game Pass 12-Month Subscription – Digital Code for just $69.99 (regularly $119). 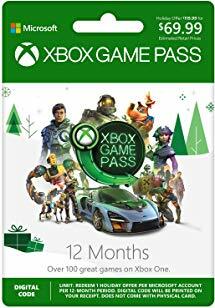 Your 12-Month Subscription will be emailed to you as a digital code that you will then redeem on your Xbox. As an Xbox Game Pass Member, you’ll gain unlimited access to over 100 Xbox One and Xbox 360 games. And since new additions are added to the catalog each month, you’ll always have a new game to play!